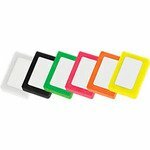 Branded erasers are a great idea for a desktop promotion because they will be kept as they so useful. 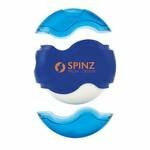 They have a good sized branding area and are ideal low-cost giveaways. 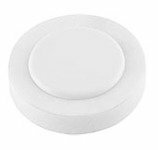 We can source more products including novelty shapes and also provide a bespoke eraser design service but this will generally involve higher manufacturing quantities as they will be custom production runs. Some clients prefer a bespoke design in the shape of their logo as it can be more unique to their marketing campaign. You may think that branded erasers have quite a narrow target market but it’s time to think this through again. We have supplied thousands of these for a wider variety of marketing events including exhibitions, seminars and recruitment events. The reason that branded erasers are so popular is that they provide a great product background onto which to print an imprint and logo. They can be vibrant and novel in shape and design and become a promotional giveaway that is kept for a long time, always within reach. As a small giveaway they are easy to hand out and distribute as well. We have found appeal to many different people. In the educational sector we have supplied schools, colleges and universities with the erasers as single items or as part of bundled stationery packs with rulers, pencil and pencil sharpeners and also as part of a kit in a branded pencil case. We have also supplied them for architects, accountants, draughtsmen and engineers. You see the anyone who uses a pencil may need an eraser and that’s why our branded erasers have proved so popular. Another great advantage is that they are fairly low cost items and comes in all sorts of shapes and sizes. 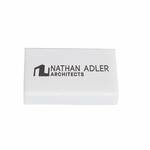 We are sure we will have the right eraser for your marketing campaign. In this collection we show a sample of the most popular products. If you cannot find the one you need please contact us and we will send you examples of ones we have within our supply chain. We can also send you free samples. If you send us your artwork our design studio can send you a virtual visual showing how your logo and imprint could look on several of the eraser products we supply. Would you call them erasers or rubbers? The correct term is the former. Some use rubber as their main compound and that’s why rubber become inter-changeable as a term and especially in the UK and Europe. Do you supply combination eraser products? We do have some erasers in our product range that include a pencil sharpener. We also supply erasers as part of kits including pens, pencils and rulers which can be given out as welcome packs for school children and students. How do you brand an eraser? We typically apply an imprint directly onto the eraser as a screen print. For custom erasers it is sometimes possible to incorporate an imprint as an embossed design into a bespoke mould. What are erasers made from? Some erasers use a synthetic rubber or synthetic soy-based gum. More expensive erasers may use a vinyl or plastic. Both lower cost and expensive erasers will do the job with the more expensive items lasting longer.